For many people, the world over, the Pantheon is just another stop on Rome’s famous tourist trail. When considered amongst Rome’s other architectural wonders, it is understandable that the significance of the Pantheon is sometimes overlooked. At its porch, eight tall columns serve to support a triangular stone pediment, behind which are eight more columns, all matching in design and size. These columns, constructed from grey Egyptian granite, are monoliths and all have Corinthian capitals and bases of white marble. Simple wooden trusses carry the timber framing for the covering of the porch. It is a worthwhile observation that although the Pantheon’s entrance has been in continuous use for two millennia, it has changed very little, especially when compared to London’s Westminster Abbey, which is continuously altered. This combined with another Roman construction innovation, coffering, which was used to create lightness in the cement, made the dome possible. Having analyzed the Pantheon in terms of its unique and groundbreaking design, one question remains. What was the purpose of this fascinating building, to which such tireless design detailing, time and labour had been devoted? Over the years there have been countless theories as to the Pantheon’s function. In 1923, Arturo Graf suggested that the Pantheon was dedicated solely to Saturn. In 1989, Gidangiacomo Martines argued that its capola is a unique example of ideal geometry. 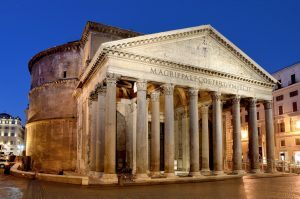 Another widely held belief is that the Pantheon functions as a solar temple and if true means that the function of the building most definitely affected its form. This is a particularly attractive explanation, especially as the oculus on top of the dome permits a dramatic shaft of sunlight to beam into the building. University of Otago’s, Robert Hannah is one expert who subscribes to this theory. Based on his observations of the sun’s interaction with the Pantheon, Hannah believes that the Pantheon may have been more than just a temple. During the six months of winter, the light of the noon sun traces a path across the inside of the domed roof. However, and as discussed in this essay, what all commentators agree on is the monumental impact the Pantheon has had on architecture. From its innovative dome and cement, to its entrance and beautiful granite columns, the Pantheon has had a truly revolutionary effect on architecture and construction techniques. For these innovations, and its unclear function, it is a powerful and enigmatic structure. For many people, the world over, the Pantheon is just another stop on Rome's famous tourist trail. When considered amongst Rome's other architectural wonders, it is understandable that the significance of the Pantheon is sometimes overlooked.